Just a couple of days after announcing that its smart TVs will soon support Google Play Movies & TV, LG has revealed that it has signed an agreement to develop its own mobile payment service called, unsurprisingly, LG Pay. 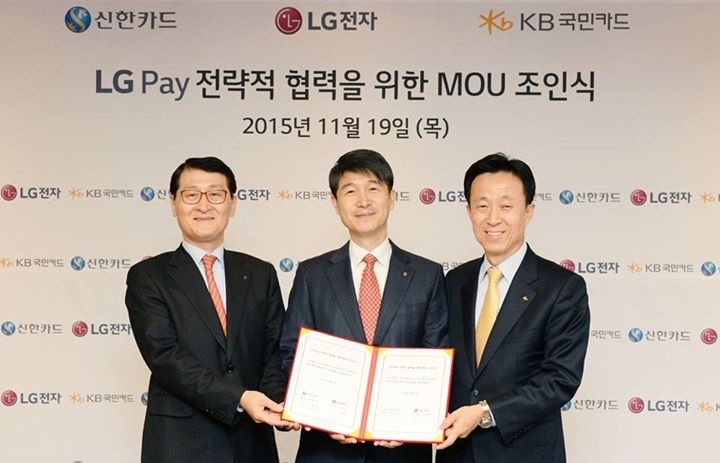 The company announced on its Facebook page that it has partnered with Shinhan Card and KB Kookmin Card in preparation for the launch of LG Pay. For those who don’t know, these two partner firms are South Korea’s largest and second-largest credit card companies, and will support the contactless payment service when it launches in the country. South Korean wire service Yonhap reported that the payment system will be available on all LG smartphones, unlike Samsung Pay and Apple Pay which are only available on more recent models, although Yonhap didn’t reveal the source of its information. Should LG Pay eventually reach other regions, it’ll likely be facing tough competition from Apple, Google, and Samsung, who have their own payment services. Samsung has already managed to sign up more than one million subscribers in South Korea, and the company is reportedly set to expand Samsung Pay (which is also available in the US) to countries such as China, Spain, and the UK next year. Apple will also be bringing its payment service to other parts of the world. The company recently announced that Apple Pay will soon be available to users in both Canada and Australia, in addition to the US and the UK. Apple also announced that it was adding more than 90 additional banks, credit unions and financial institutions for US users.